We’re approaching the steamy time of year in New Orleans where all I want to eat is cucumber slices, Pimm’s Cups, and various chips and salsas. It’s not for the faint of heart… mmkay? I was thinking we’d go ahead and call this our summer-vibing Hot Dish. The kind we bring to our friend’s pool parties. This is totally a summer casserole, don’t you think? Something to pile all those salsas on top of. Also… here’s something to add to the to-do list: make sure to solidify friends with pools, acquire plastic tumblers and perfect your spritzy Pimm’s Cup recipe. In other words, we have to be the kind of people that people with pools want to invite over. Get into it. This is one of those very flexible recipes that can be tailored to your taste. Maybe you’re more of a red sauce person? A shredded pork person? A green olive preference? Get after it. Consider this recipe a pile of very good, though very amiable suggestions. 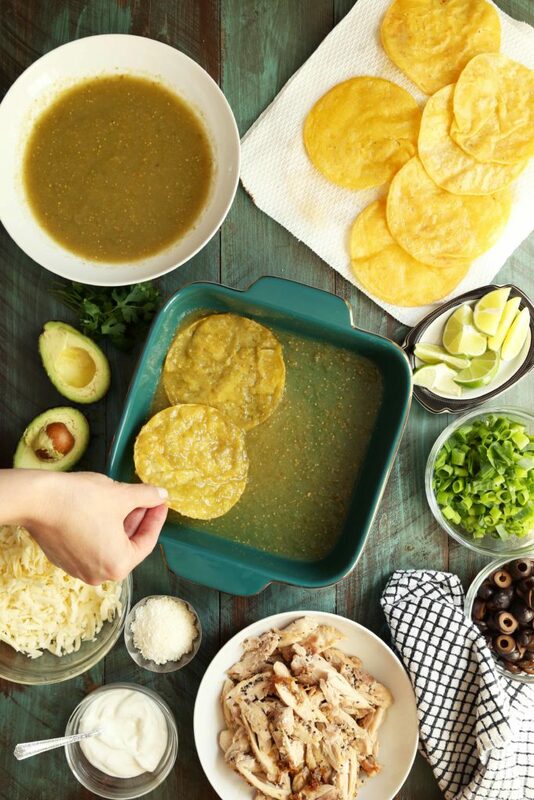 • a dozen corn tortillas, lightly fried in oil and patted of their excess. • chicken breasts, pan seared, cooked through and chopped into big bit-sized bits. • green enchilada sauce, it’s mild and bright. • chopped scallions, whites to greens. • sliced black olives, really the best. • grated Monterey Jack cheese, it’s so melty which is exactly what we want. • sour cream, sliced avocado, lime wedges, and queso fresho for topping. Once all our ingredients are assembled, we’re all about assembly. It’s really quite easy – like making soft nachos in a deep dish pan! In a square baking dish (mine is somewhere between 8 and 9 inches) pour about 1/2 cup of green enchilada sauce. Dip the fried tortillas in more sauce and layer them in the baking dish. That chicken we fried up – that’s next into the baking dish. Half of the chicken is our second precious layer. Grated cheese, lots of it. That’s the next layer. Consider it glue. Sliced green onions and black olives. That little onion bite and creamy salty olive bite is simple and perfect. Another layer of sauce-dipped tortillas. Four more! And we’re back at it with another layer of cheese, the remaining chicken, and more of that green onion and black olive combination. We’ll top the dish with one last sprinkle of cheese and whatever is left of the enchilada sauce. 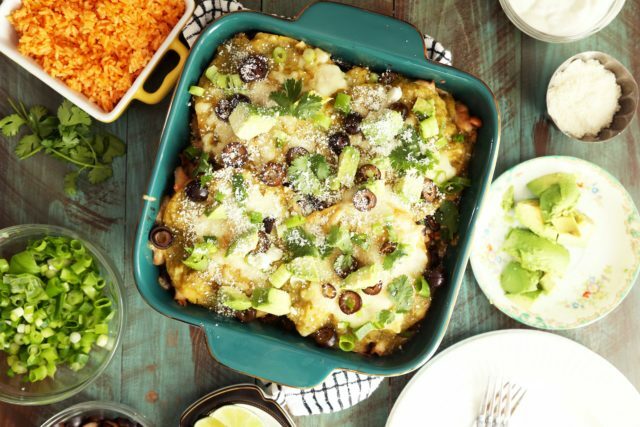 Baked until bubbling (which really doesn’t take long at all) and topped with fresh green onions, more black olives, cilantro leaves, avocado chunks, and a sprinkling of queso fresco. Lime wedges and sour cream on the side just for kicks. Photos with my friend Jon Melendez. Prep all of the ingredients before assembling the enchiladas. Fry the corn tortillas until crisp and lightly golden on both sides in a bit of vegetable or canola oil. Dab the tortillas on a paper towel and allow to rest. Cook the chicken breasts in a skillet over medium heat in vegetable or canola oil until golden on both sides and cooked through. Remove from the skillet and allow to rest for ten minutes until cooled just slightly. Chop into bite-sized pieces and set aside. Place the enchilada sauce in a wide, shallow bowl. Grate the cheese, chop the scallions and olives. Chop the cilantro, slice the avocado, and slice the limes. Ok you're good to go! Place a rack in the upper third of the oven and preheat oven to 375 degrees F. Lightly spray a 8 or 9-inch square pan with non-stick spray. Spoon about 1/2 cup of enchilada sauce into the bottom of the baking dish. Dip four of the fried tortillas in the enchilada sauce and place in the bottom of the baking dish. Top the tortillas with half of the chopped chicken, just left than half of the grated cheese, less than half of the sliced olives and scallions. Dip four more tortillas in enchilada sauce and layer onto the chicken et al. Top with the remaining chicken, and most of the remaining cheese, olives, and scallions. Save a small handful of the cheese olives and scallions for the top of the dish. Add any remaining enchilada sauce to the top of the dish. Set that aside. Dip the four remaining tortillas and add to the dish. Top with the remaining cheese, olives, and scallions. Bake until warmed through and bubbling, 18 to 20 minutes. Remove from the oven. Allow to cool for 15 minutes. Top with chopped cilantro, avocado, and quest fresco. Serve with sour cream and lime wedges. Previous Post: « Let It Be Sunday, 172! This was amazing! I substituted salsa for enchilada sauce..still delicious! 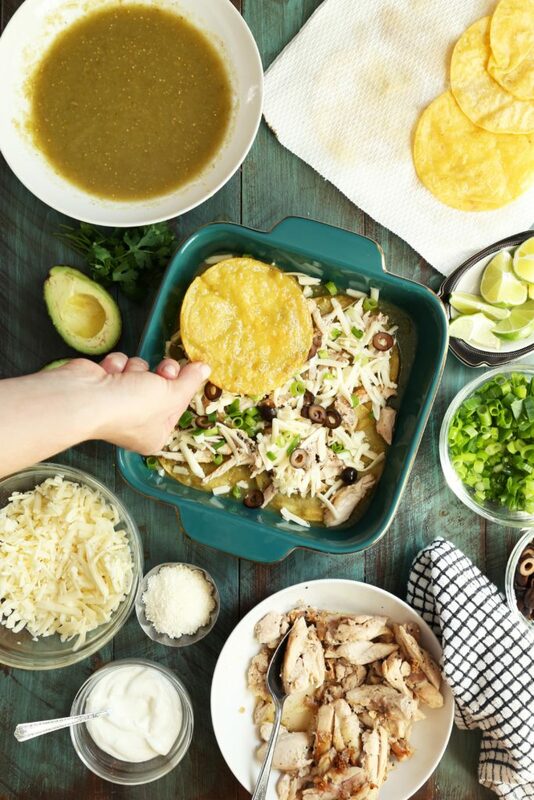 I use La Costeña green enchilada sauce. Maybe in an international isle? So simple and SO flavorful!! 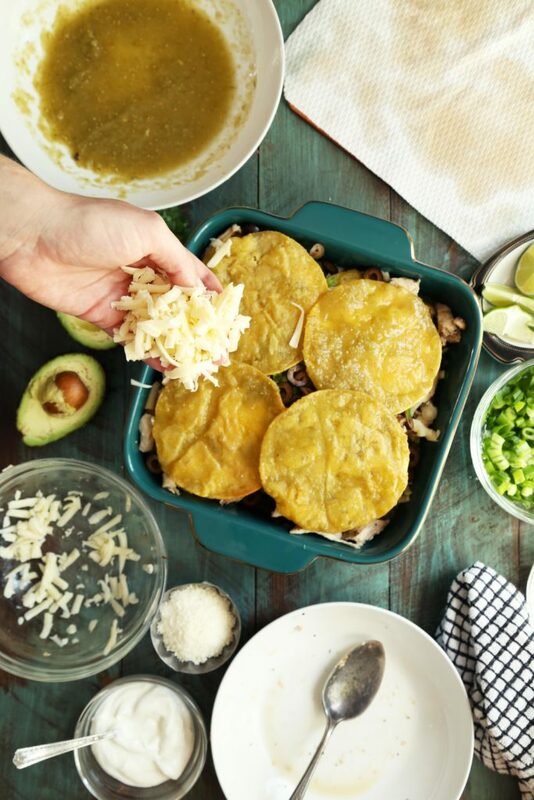 Great tip on frying the corn tortillas a bit first — excited to try this! I made this last night and it was pure bliss!!!! I had an oldish bag of tortillas and several sad, half-opened, nobody-wants-to-go-back-in jars of salsa. This was my first time frying tortillas, and normally I would never do that kinda work for a dang casserole, but I got seduced by your pictures as I like to do. Let me tell ya, frying tortillas is totally therapeutic and the end result was ah-mazing. Do it for the texture!!! My husband I will be greedily keeping this dish to ourselves. I made this tonight in a desperate attempt to use up smoked turkey breast…we got a smoker and boy, do we have left over smoked meat! My husband would never order let alone volunteer to eat this dish….I just did not tell him it had enchilada sauce…he loved it and had a second helping I did not pay attention to the ingredients and only when I was in prep mode did I see I needed enchilada sauce and NOT green chiles…no problem…made some with the chiles….so very, very good. Thank You Joy! This was so easy and tasty. It is going to one of my go to recipes. I made this last night and it was delicious. I used Costco rotisserie chicken, jack and cheddar cheese, kalamata olives, and threw in some corn and sautéed onion. I garnished with sour cream and avocado. I used about half the can of enchilada sauce and froze the rest for the next time I make this. So good! I made this tonight for dinner and it was excellent! 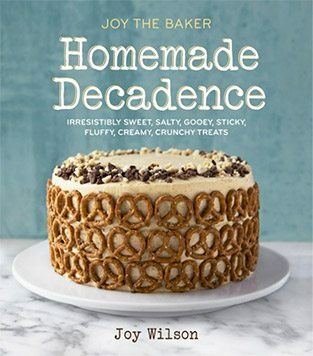 Thanks for a great, easy recipe Joy! YAS! Feeling this for friends who are about to have a baby! Seems hearty and freezer friendly. Frying the tortillas help them hold their texture and not turn to mush. I promise it’s worth it! This looks so delicious! You are so right about this time of year. I have lived in New Orleans near my whole dang life and I do not have nearly enough friends with pools. Oh gosh. This time of the year in NOLA always made me want to eat ice cream and then take a nap. Repeat daily until the weather cools in November. May you find a pool to ease the heat!